No doubt, link building is still an in-vogue topic not only because it is one of the most important ranking factors, but also because it’s a vital part of any brand’s credibility or PR strategy. People tend to purchase services or goods from familiar brands, so that means your company’s name has to resonate with your potential consumers when they are sifting through numerous other brands. 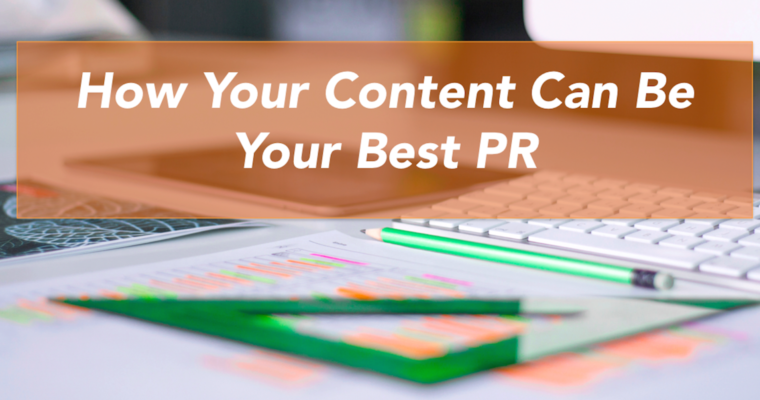 Being mentioned by popular online news resources is one of the best ways to gain your clients’ trust. In this article, I am going to discuss some link building strategies that any company will find affordable to implement. Since I have in-depth expertise on building links through content creation and distribution, that’s what we’re going to focus on here. I strongly believe that basing your link building strategy on content management principles will not only earn you links but will also increase social shares along with referral traffic. Whether you’re presenting an existing idea in a new light, capturing a new audience, or simply growing your list of connections, interviewing the right people for their insight is a smart move that makes sense for brand publishers. However, it’s so easy to bungle or miss a potential opportunity. The worst thing you can do to an expert, apart from insulting them, is to waste their precious time. Prepare your interview questions in advance so they are centered around the expert’s recent research, post, speech, etc. By using this strategy, you’ll significantly increase your response rate since you’ll show that you want to talk about things they are interested in. A hassle-free way to find an expert’s most recent content is to search for it via BuzzSumo. For example, here’s what you get if you search with the query “author: alexandra tachalova”. The best way to strike up a conversation online is to share your creation on Twitter or LinkedIn, tagging the expert in your post. That expert may have served as an inspiration to you, or they may have reached an interesting conclusion after analyzing heaps of data, or maybe you can prove this expert wrong. In any case, after you’ve tagged your expert, you can approach that person directly, be it via a Twitter private message, or a good old email. In one of my previous articles, I described the ways you can get hold of anyone’s email address. Because everybody uses the Internet. 3. Study up on your expert’s portfolio (if it is accessible). This one should guarantee you a backlink to your published interview (provided you didn’t mess the aforementioned things up). Most industry experts have a separate section on their websites where they list all the written works they have ever contributed to, whether directly or indirectly. However, some experts, due to a genuine lack of time or excessive confidence, don’t think they need to have a portfolio. So make sure the experts you’re interested in connecting with do have this section on their websites. Otherwise, your chances of getting a backlink are minuscule. At this point, you’re most likely wondering how to track down those experts and avoid spending hours filling out registration forms, checking their websites, and engaging in other standard stalking activities. Ladies and gents, I am more than happy to share my ways of solving this dilemma. Research several round-up articles or interviews relevant to your industry, and see who is linking to them. Monitoring competitors, topics, and influencers in your niche: this can be accomplished using tools like Ahrefs or Majestic. Every brand or company that wishes to proliferate its success has to listen to their users. Always. Considering customer feedback is extremely important for any business striving to provide their customers with the products they need. This strategy doesn’t require a lot of work. Even if you are not a registered user, you can still reach out with your comments, suggestions, or questions. Your goal here is to find those companies that have a website section dedicated to feedback and do whatever it takes to get your feedback published there. Product Hunt, an online hub for all up-and-coming brands, is also a place that connects companies willing to receive customer feedback and those looking to provide it. You’d be surprised to know how many new companies are established weekly. Based on my experience, there’s a greater chance your comment will be published in their customer feedback section, or even make it on their main page if you reach out to a newly established brand. It’s your lucky day! 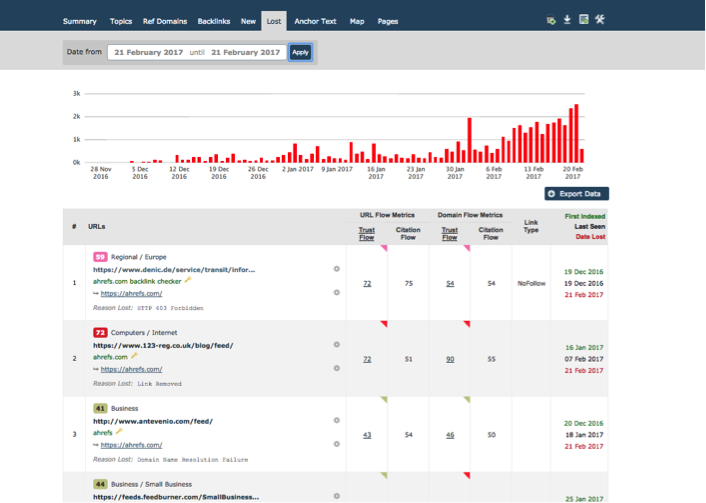 The company you are looking to get a backlink from has a feedback section, like Serpstat’s Users’ Experiences. Now, calm down and pull yourself together. Concentrate on the message you want to transmit. Describe your overall experience; tell them how much easier your life has become ever since their product has come into your life. But don’t go overboard with the praise. No one is going to believe a cheesy statement. Aw, what’s wrong?! They don’t have that feedback section you were looking for? Well, that’s a bummer. But don’t give up. Have you checked if they publish user case studies? They could be featured on their blog or ‘About’ page depending on their site’s structure. When writing a case study, you need to describe your situation before you started using the product, how your situation improved over time, and of course, how head over heels you are now that this product is in your life. Be specific, try analyzing the product’s features. If your case study provides valuable insight or shows how a real problem can be approached and solved using this product, then it’s a sure shot they’ll feature your story. This tactic doesn’t necessarily require content per se, but I still consider it relevant to the matter. First things first, you need to track these mentions. To do that, try using Google Alerts or BrandMentions.com — they are free of charge. There’s also Brandwatch.com, which offers market research and reputation management. Moz has a really neat tool that, if you spend some time digging up the history of mentions (that can go back as far as 30 days), will reveal some valuable data. You decide which tool you like better. I’ve learned that the best way to turn your unlinked brand mention into a link is to reach out to the article’s author directly. BUT, you need to craft a really good pitch. So you think they have to link to you just because they mentioned you? No, they don’t owe you anything. Think it through and compose a well thought-out pitch. Make it advantageous for them. 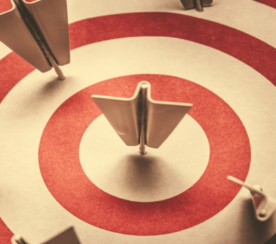 Since there’s no sense trying to get brand mention on a non-relevant site, you have to share the same niche or interests with the company or a brand. Link to the company’s content on your blog. When crafting your pitch, mention that you previously referred to their fascinating content in one of your studies. Ask any of the industry’s experts for a tip or quote to use in the piece that you’re planning to publish shortly. 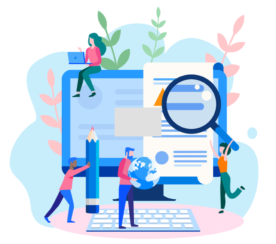 Turning brand mentions into links is all about finding citations and reaching out to the person responsible for the page to get the brand mention turned into a link, which is much less hectic than crafting a new piece of content from scratch or performing broken link-building. When using this tactic, you can’t do without reports like the ones offered by Majestic or Ahrefs, which help you find your competitors’ lost links. As the name suggests, a lost link is one that doesn’t exist anymore because it has been deleted by a webmaster. “Hello, [Someone at the Brand]. My name is [your name], and I am a [whatever it is that you do for a living] at [your company’s name or website]. I first came across your article [insert the title of the post] a couple of weeks ago, and I really enjoyed reading it. As I’ve started working on my own post weeks after, I wanted to check back on a few things you covered in your research again, and noticed that there’s a lost link in the [such and such] paragraph. I have just published a thorough research article on the same topic as the piece that link is supposed to take your users: [insert your post title and the link]. You are more than welcome to link to my article, which will provide your blog’s readers with a better user experience. My article will add value to your work and make your research more in-depth. I will keep my article up to date so that its readers have access to the latest industry trends. Let me know if this is something that may interest you. Analyze the information you receive, then all you need to do is deliver content similar to what that site was referring to but is currently missing. Sounds like a lot of effort, doesn’t it? Yes, it requires you to invest some time into this type of data analysis, but there’s a good chance you can deliver a piece that will turn a couple of brand mentions into links. I wouldn’t recommend using guest posting solely for link building — only because it’s too expensive. In order to cut down on your expenses, try to locate those sites that can potentially drive referral traffic to your website. 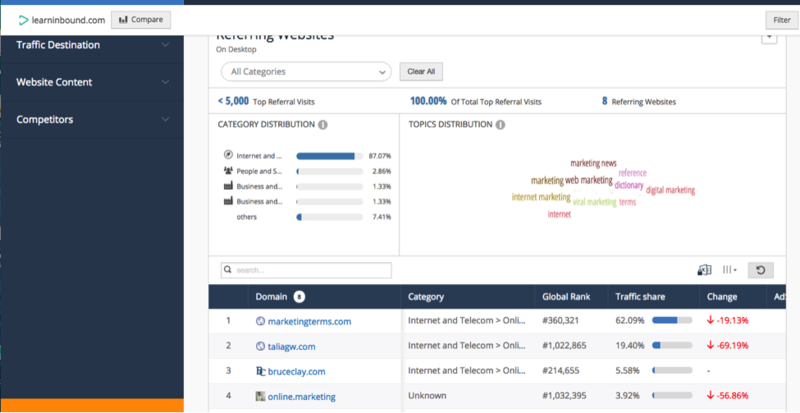 In order to do this, you’re going to need a tool like SimilarWeb, which allows you to find sites that are sending referral traffic to your competitors’ websites. For instance, in the screenshot below you can see who’s sending the most traffic to LearnInbound.com (By the way, I highly recommend that you get acquainted with the videos from the company’s previous events that they’ve posted on their blog). After evaluating your traffic flow, you need to filter out those websites that don’t accept guest posts or co-branded content. Some blogs aren’t interested in content from other authors, but eager to cooperate by creating stories together. When it comes to guest posting, keep in mind that websites are always looking for bigger fish to fry; they want to get top-notch experts or exclusive content. So unless you are that big and important, it makes sense to start small, reaching out to less buzz-creating blogs. Another reason here is that you need time to figure out what is the definition of exclusive content within your niche. 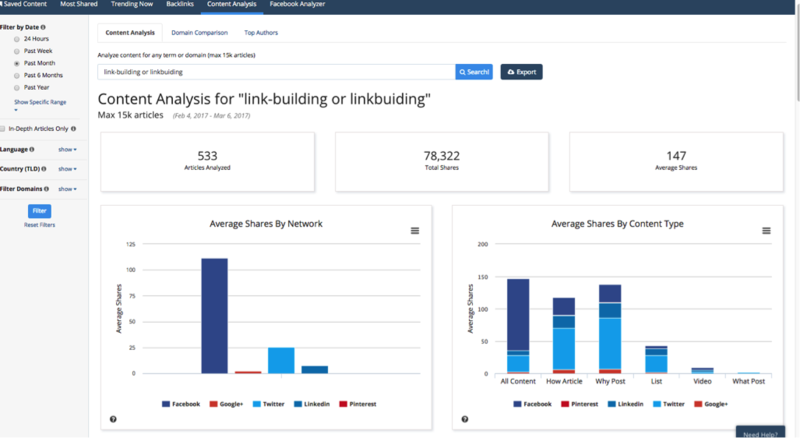 Use BuzzsSumo to analyze what kind of topics those brands/websites cover (simply type in a blog’s name and then download a generated list of topics). For example, you can get inspired by a recent update or a change of some sort (like new Google updates or mobile page requirements, and so on). Pay attention to the style of the articles on their blog. See if they prefer to use subtitles, captions, or short or long paragraphs. Do they require you to comply with a formal style guide, or are they into bold and lively statements made informally? All of these nuances make a difference and most posts get rejected because of uninformed authors. One of the biggest misconceptions in SEO is that quality content generates natural links on its own. No, it doesn’t. You’d be surprised to know that thousands of site owners produce hundreds of quality articles on a daily basis. And they don’t have a single backlink to show for it. To score links in a world jam-packed with content, you need to take your game to the next level. 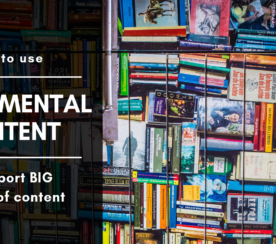 In this post, I walked you through the link building steps any company can and should implement if it wants to create link-magnet content. Now, it’s time to put these tactics into practice! I’m looking forward to hearing your link building success stories. In-post Images: Screenshots by Alex Tachalova. Taken February 2017.